Save the date! Come see (and buy) art! I recently started creating shadow boxes that feature my "rearrangements," and I've had fun incorporating collage into the pieces. I wanted to experiment with collage to get ideas for the shadow boxes and to create a range of styles, so I began to get a little playful and am making some stand-alone pieces. What started as an exercise has turned into something bigger. I will use what I'm teaching myself in future rearrangements, but I will also continue to collage separately from the sculptures. By the time SF Open Studios rolls around (October/November), I expect to have two discrete and substantial bodies of work, and perhaps a third: a hybrid of the two media. I have quite the collection of old rustic frames, and I think now is the time to fill them. Experimenting with gold paint for a piece called Tower of Trump. The book from which the pages will be used will be revealed when the piece is completed. Pictured are practice pieces from another book. A great find on the street houses the building blocks of the rearrangements! 30 drawers now do what piles of bowls and bins and boxes did, and much more tidily! This helps to unclutter some surface area in my studio! A shipment of handsome buttons arrived today, and two will be included with every PipSquake purchase! A PipSquake makes an incredible companion, especially for those who are companion-challenged. The timeless design of the PipSquake is based on your grandfather's childhood imaginary friend. Honor your poppy and buy your PipSquake here. This is a compact (stubby) version of the regular squake. He is a mere 3.5" long (not including tongue) compared to the sleek and slender 6.5" regular squake. He fits nicely in the palm of your hand, and loves traveling, long walks on the beach, or just a nice quiet evening at home, perhaps with a glass of wine, a stir fry, and netflix. Look for him soon in the shop, and when you see him, adopt him (unless, of course, you'd rather travel, walk on the beach, cook and watch tv all alone). I'm trying some solid color wools this holiday season. I thought a couple red strips on the label would help make them pop! Gearing up for holiday season with the production of Squakes and a new label! Will offer many new colors and patterns this year. They are for sale now on Etsy, and I am creating a store on this site as well. I'll also be selling them directly from my home (to friends, by appointment) and at the annual holiday sale in Berkeley (announcement will follow). 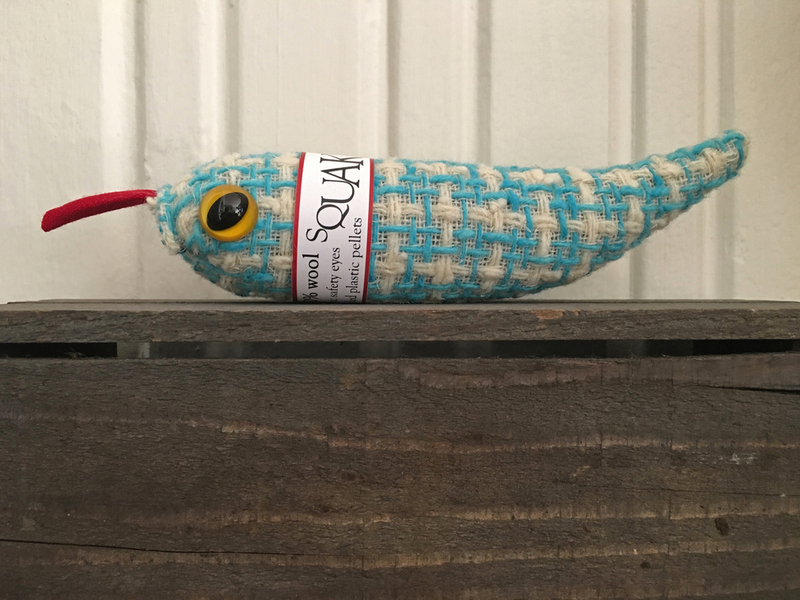 If you'd like to see Squakes in your store, please contact me for wholesale information. 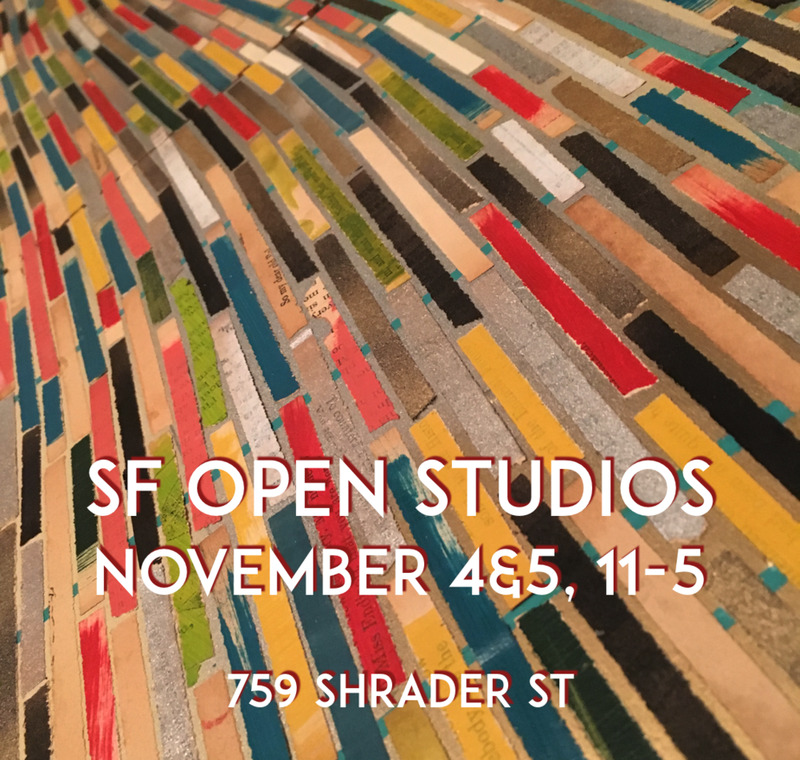 Announcing ArtSpan's SF Open Studios: Saturday, October 24th and Sunday, October 25th, from 11am to 6pm. Come say hello and see works nearing completion and get a glimpse of what's coming next! Let's talk about how you've outgrown that sad clown art, but haven't yet mustered the energy to rip it off your sad clown walls. Perhaps you need something woolly in its place. In the adjacent studio, you'll see what Nancy Spoelhof is working on these days; you will love it!! Just finished piecing this yesterday. The fun part is done, and now I have a few works that need to be backed and prepared for hanging. 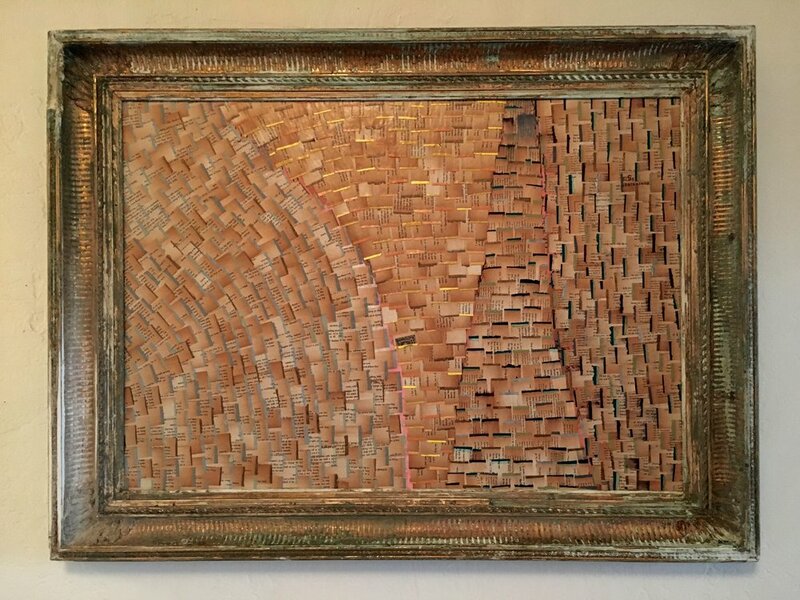 The final size of this piece is approximately 27" x 27". Detail of 'California Poppies'. These are actually upside-down, but I thought they looked pretty interesting in this orientation. 15 rows done. Probably 15 more rows of the 'earth' pieces, and then 20-25 rows of sky pieces. This will end up being about 40" x 40". The right side in the photo will be the bottom of the hanging. It's amazing how much of this process in problem-solving. There is a flash of creativity, and the rest is figuring out how to do it, and then taking the tedious steps necessary. The sweet spots are on either end of the process -- the seed and the fruit! I designed a shape that should be very versatile, allowing for many different patterns depending on their placement, and took enough fabric to Kirin Cutting (on Capp Street in the Mission, SF) to keep me busy with this shape for a while. A total of 24 yards of 16 different wools! I've been going to Kirin for years, first with the Woollyhoodwinks and now for the larger of the fiber art pieces. They can do in an hour or two a cutting job that would take me weeks! Impressive people running an impressive business! Britex, How Do I Love Thee? A field trip to Britex is never not fun and overwhelming and fund-depleting (if you spend too much time there, or look at anything)! Today, I pretended that I'm a lot richer than I actually am, and walked out of there with a few pounds of incredible wools. Douglas, my regular salesperson, was not in. The young woman who helped me was patient and wonderful, as is all of their staff. Unfortunately, the photo does not do these wools justice. But trust me -- they are nice! Bad kitty. He was shooed away right after this photo op was taken advantage of. He just looks too good against a colorful background. I'm quitting for the day, and this is currently 40" tall x 34" wide. I'll probably go another 4" to 6" high. Then it'll be time to piece California Poppies. That's going to be a beast! This will end up being about 34" wide and somewhere between 36" and 48" inches tall -- it will be done when it looks done. I will have enough pieces left over to make a smaller one in the same palette, perhaps 18" x 24". This small side project grew and grew, and will now be about 12 sq ft. I look forward to seeing the finished project, since not much planning went into this one. You know what gets old? Ironing. Ironing gets old very quickly. Sporadic posts to keep you somewhat up to date on the goings on and the evolution in the studio.